Despite averaging 6.6 yards per carry on 98 attempts last season and filling in admirably when injuries and transfers depleted the Vols’ depth, Tennessee junior running back John Kelly hasn’t received a ton of attention from the national media. One outlet, however, thinks Kelly is ready to burst into stardom for the 2017 season. Yardbarker compiled a list of ten college football players they believe are ready to be stars in 2017. Coming in at No. 10 was Tennessee’s own John Kelly. The article claims that “based on what Kelly has been able to accomplish in his limited opportunities as a freshman and sophomore, fans should be excited.” Kelly amassed 630 yards on just 98 carries last season, scoring five times as well. Kelly ran for just 18 yards on three carries in the Vols’ first five games of the season but ran for 89, 94, 94, 101, and 104 yards in five of the Vols’ final eight games of the 2016 season. Aside from Kelly, the Vols only have one scholarship running back on the roster as of now. Sophomore Carlin Fils-Aime is the only running back currently on the roster, but freshmen Ty Chandler, Trey Coleman, and Timothy Jordan join the roster in the fall. 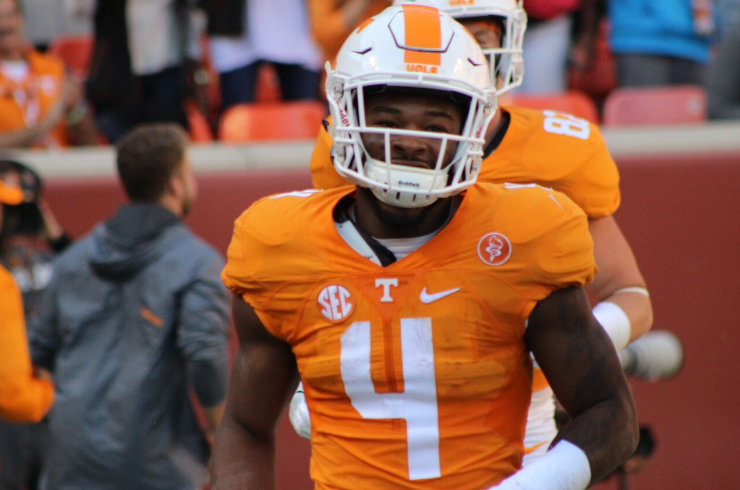 Fils-Aime has just 14 rushes for 58 yards and two scores in his one year of action for Tennessee. Kelly only started one game last season and filled in during games when Jalen Hurd and Alvin Kamara were injured. Once Hurd transferred, Kelly split time with Kamara and found his groove on offense. He’ll be Tennessee’s lead back in 2017 barring a setback of any kind.